Both Men's and Women's Teams in Action! It was a cracking weekend of Rugby for the Berlin Irish with both the Women's sevens and Men's XV teams playing away from home. Saturday saw our ladies on the 3-hour drive up to Lübeck where they jumped back into the National Women's Sevens league (Division East). The hard work over the winter paid off and they pushed reigning champions Rugby-Potsdam hard in their first game, followed by a tough loss against League Runners up Rugby Klub 03 Berlin. The final game was a straight shoot out between the Irish and local rivals Frauenrugby Berliner SV 1892 to finish 3rd and still have a chance to play for minor prizes in the Bowl (5/6th) playoff. Irish took the lead early on and stretched it out to 20–7 through tries from top Scorer Giese and newcomer Czerny but were then forced to hang on as BSV clawed their way back into the game with two more tries to bring up a final score of 20–19 to the Irish. Heading into the 5th place play off the girls were faced with perenniel play-off opponents Kiel Rugby who were themselves having an improved tournament. In a free flowing match though the Irish ladies were able to put their new high intensity play style to good use and through tries from Captain Böttcher, Aras, Czerny and again Giese they pulled away to comfortable 34–12 winners to take 5th place—their highest ever placing in a regional tournament. The 5th place finish is worth 12 points and sees the ladies pull away from the 3 teams clustered at the bottom of the table and towards BSV and Hamburg in 4th and 5th. The ladies were amazing today and really made an impression. The big teams learned that they need to bring their A game against us. The team are really starting to click now under Mike Hornes leadership, they're working hard for him and each other, and they can take alot of positivity from this going forwards! 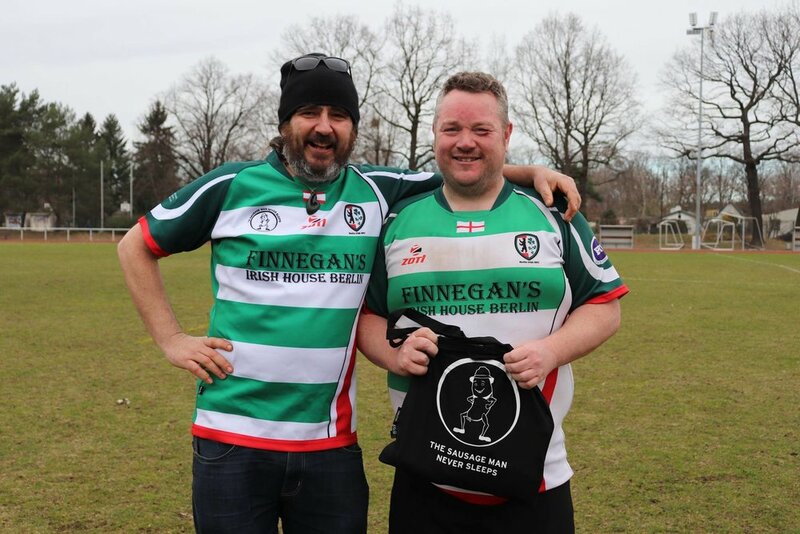 Sunday saw the eagerly awaited Finnegan’s Derby against Sport Club Siemensstadt Rugby from Spandau. Infront of around 100 spectators the team were able to convert early pressure into a lead with Flyhalf Tom Probert calmly converting a penalty from 20 yards out. The Irish worked their way back into the SCS half but ill discipline at the breakdown lead to a series of penalties and allowed the Spandauer to kick up for a line out and driving maul in the Irish 22. Although this was stopped short of the line, aggressive pick and goes found a hole and the hosts were 7–3 up after 20 minutes. Identical scenes almost immediately after lead to hard words under the posts from Captain Viehoff and Coach Turner and the Irish set out after 30 min 14–3 down knowing they had a lot of work to do. Refocused they started to move the ball around with aplomb. A 40-metre sprint by Winger Marquez and then further 20 m contested drive by prop Behrendts left the Irish within striking range of the SCS line. Quick hands through the backs and a sumptuous offload from Ciocca saw Daubney dot down out wide to bring the scores up to 14–8 at half time. Straight from the restart a mix up in the Irish defence allowed an SCS player an uncontested run to the line, scoring and converting to leave the SG with even more work to do at 21–8. To their credit they stuck to it and a clever kick and chase followed by excellent hands from the whole team set up a great position 5 yards out. Nieveler reacted quickly following a tap-and-go penalty and steamed over the line next to the posts, converted by Probert to take it up to 21–15 to the hosts. Reinforcements went on in the form of Zehrer, Opar and O'Mahony with the first two combining well to carry amongst the Spandau forwards into the 22, with space out wide the backs wanted it but the Forwards weren't to be denied, three times they tried twice short but then Boden worked around a tired pair of Siemens arms and dived over for the visitors 3rd try, sadly unconverted. Now just a one point game things began to get heated with both teams losing a player to the sinbin after some handbags following a held up Irish drive. No matter what SCS tried though they couldn’t clear their lines and Irish recovered and good play from substitute Jayasuriya and Winger Heinemann pulled the defence one way—allowing a simple backs line move to put Flyhalf Probert into the corner for his first ever Regionalliga try to send the Irish 21–25 up with just a few minutes to go and the Greenclad contingent in the crowd absolutely bananas. With just one minute to go Irish thought they had won it when Zehrer and Detomaso clattered into an onrushing Siemens attacker forcing a knock-on and allowing an Irish controlled scrum on their own 22. Ill discipline was the downfall of the team however with an early push seeing the referee awarding a free kick to Siemenstadt which was quickly taken, bypassing much of the Irish defence and then shortly afterwards scored in the corner (and very well converted by the Spandauer kicker) to take the game out of the reach of the SG with time having run out. The team leaves Spandau with 2 bonus points, a more positive attitude and a happier coach. Probably one of the best games of Rugby we've seen. In attack we looked bloody fantastic today, we did the basics really well, kept our calm and moved the ball around in great conditions and scored some properly lovely tries. Defensively we've got a good few things to work on this week but I think it's more of an issue of experience. We had players switching off in the middle of a game, not transitioning back into the defence quick enough and Siemens were able to take advantage of that, fair play to them. It's sad to have come away without a win after that performance, but I think we all agree that that performance was simply so much better than the last few games—so I'm pleased there, and we'll work on the rest this week before we head out to BSC next Sunday. After the Match our Sponsor The Sausage Man Never Sleeps was on hand to present Man of the Match Charles Boden with his prize—an exclusive Premium Bacon and Sausage Fry Up Kit. Thanks for coming down to watch Sausage Man and inspiring our players (particularly the forwards) with your generosity! 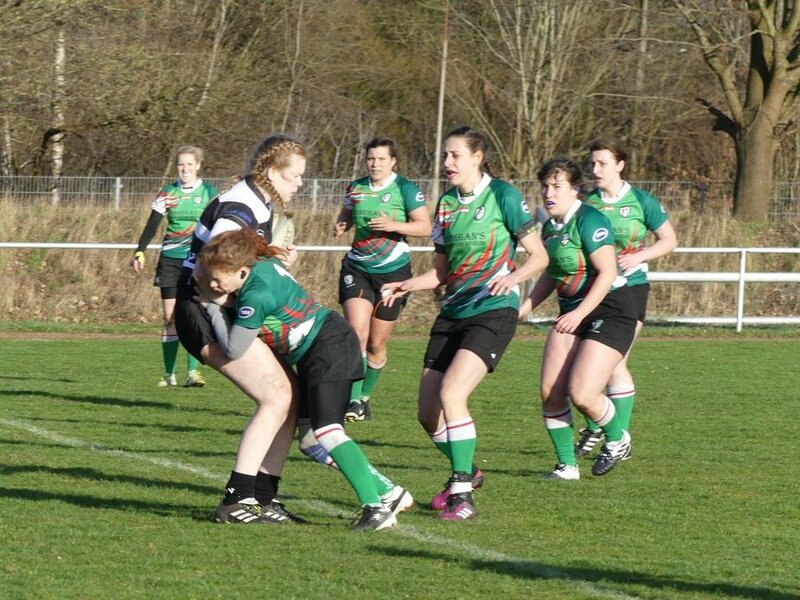 Berlin Irish RFC are delighted to announce that following an intensive search and interviews with several candidates, ex-StuSta München, Copenhagen Exiles and Erfurt Oaks player Friederike Giese will be taking over the as Women's Head Coach as well as continuing her playing career with the Berlin Irish. Friederike brings tremendous playing Experience in both sevens and XVs as well as previous experience coaching both adults and junior players. Her remit includes Training and Player Development as the Berlin Irish Women's VIIs look to continue their tremendous growth and move up the Division-Ost Table. Want to Join Our Women's Team? We'll be sure to get in touch with you as soon as possible. 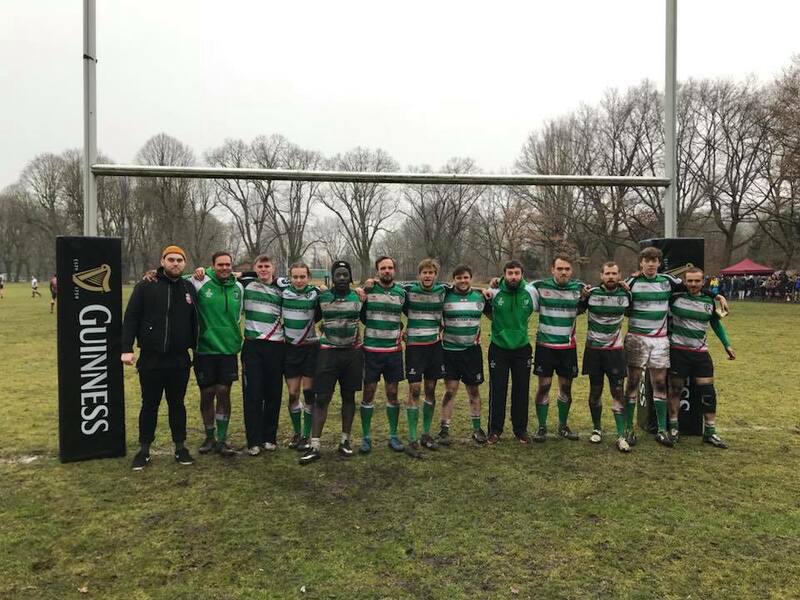 With poor weather cutting training possibilities short and injuries to a number of players, the Berlin Irish managed to bring together a total of 14 fit players into their 7s squad for 2018. 3 weeks of intensive sevens training were beginning to pay off however as the Lads' looked more fluent each session. With only 12 spaces available, Gomez and James drew the short straw and were loaned to Fortuna Neuenkirchen who arrived with only 5 players! Despite initially falling behind to three easy Velten scores the boys in green hit back just before halftime through a clever cross-field kick from Allan to set up Ewen for an clear sprint to the line. The second half was all Irish, with McGee crossing after just 2 minutes after clever interplay with Paterson in the centre of the park. Next Irish thought they had equalised but Allans pass to Paterson in the build up was judged to be a forward pass. Finally with seconds remaining Viehoff broke a tackle in the centre and beat all the chasing defenders to the line; Ewen kept his cool and slotted his 3rd conversion to give Irish their first victory. The game opened with Ewen scoring a quick brace, once showing a turn of speed to beat a defender, and the second to hammer through a despairing full back to go straight over the line. Hennigsdorf tried to respond but the aggressive Irish defence limited their oppotunities in the first half as Allan powered over on the wing to give Irish a 19-0 lead at half time. The second half was a different story with Hennigsdorf moving the ball quickly from wing to wing to stretch the Irish defence. Eventually after a quick tap from a 5 metre penalty Hennigsdorf found the line in the corner. Irish responded with strong carries in the centre leading to tries for Cox and Viehoff meaning a late Hennigsdorf score was merely a consolation. The group leaders RK03 were a very different beast, specialised Sevens players moved the ball quickly along the line making it difficult for the Irish blitz defence to function. Two quick tries put RK 14 - 0 up within the first minutes, but Irish held on until the break, with Opar chopped down agonisingly close to the line just before half time. The second half was more of the same, but Irish focused on the breakdown, repeatedly releasing pressure on themselves with good work at the rucks. A late RK try under the posts left them with a 0-19 victory. With legs tiring, the Irish were simply overpowered, first by eventual winners USV Potsdam in the Semi's then by RK03 in the 3rd Place match, leaving themselves a very respectable 4th Place in their first BB7s Series Tournament. + 10 Player Coupons (2 Drinks, 1 Sandwich or Hotdog / Steak and Showers Token). + Also includes Beer for the Tournament highlight, Boatraces of the 3rd Half! Berlin Irish RFC have teamed up with Zotisports Teamwear to offer Rugby Shirts, Shorts and Socks, Training Kit and Bags for sale in our brand new online store! Everything's new, everything is Green and everything is in stock! Get your purchases in now whilst you can! The store will be open seasonally for 2-3 weeks at a time whilst orders are processed. You pay directly to the store and then pick up your order from Nele Börner (Berlin Irish Equipment Manager).